The fully renovated Church of Scientology of Los Angeles was rededicated April 24, 2010 in ceremonies attended by 6,000 Scientologists and their guests. Officiating was Mr. David Miscavige, Chairman the Board of Religious Technology Center and ecclesiastical leader of the Scientology religion, joined by city, county and state dignitaries. California State Assembly Speaker Emeritus Karen Bass: "Through human rights education, we empower everyone to lift their voice and to be heard. The Church of Scientology I know has made a difference, because your Creed is a universal creed and one that speaks to all people everywhere." Los Angeles City Council Member and historic preservationist Paul Koretz: “We needed to transform Hollywood with a cultural revitalization, one that would then ripple out across all of LA. What we are witnessing here is the essence of that Hollywood transformation. Because if ever today there is an example of making this the city of our dreams, it is the Church of Scientology." Leading up to the grand opening on April 24, the Church underwent a five-month full renovation, culminating in the ribbon cutting by Mr. Miscavige and city, county and state officials. After the ribbon was cut, thousands of parishioners and guests streamed into the new Church’s reception area, leading into the multimedia Public Information Center. The Church of Scientology of Los Angeles, established in 1954 and the largest in North America, is a Hollywood landmark at Sunset Boulevard and L. Ron Hubbard Way. The main reception area off Sunset Boulevard welcomes parishioners and guests for the Church’s events and services. The bookstore adjoining the main reception area, offering a selection of L. Ron Hubbard’s books and lectures. The Church’s side reception, leading directly to the Public Information Center and its multimedia displays. Open to all for self-guided tours, the Public Information Center presents principles of Dianetics and Scientology, the Church’s global humanitarian programs, and the life and legacy of Founder L. Ron Hubbard. The chapel serves parishioners and guests for Sunday Services, Weddings, Naming Ceremonies and other congregational gatherings. The Dianetics Seminar Room, where people from all walks of life are introduced to the principles and techniques of Dianetic therapy. In the Life Improvement Course Room, students learn a variety of Scientology tools for bettering conditions in their lives. The bookstore offers the full library of L. Ron Hubbard’s written and recorded works, comprising the Scripture of the Scientology religion. The Purification Center provides refreshments and supplements for parishioners receiving a precise and closely supervised religious regimen called the Purification Program. The lounge of the Hubbard Guidance Center, where parishioners arrive for spiritual counseling delivered by ministers of the Church. Religious counseling rooms are precisely appointed to create an ideal environment for one-on-one spiritual counseling by Scientology Ministers, enabling parishioners to find their own answers to life's questions. Scientologists pursue professional studies of Dianetics and Scientology in the Church’s newly renovated Academy. Every Church of Scientology maintains an office for L. Ron Hubbard, Founder of Dianetics and Scientology, as a sign of respect and loyalty to his religious teachings. The world’s first Church of Scientology, formed in 1954, joined the global roster of Ideal Churches of Scientology on April 24, 2010. Six thousand parishioners, guests and Los Angeles-area officials were on hand as Mr. David Miscavige, Chairman of the Board of Religious Technology Center and ecclesiastical leader of the Scientology religion, officiated at the ceremony dedicating the new Church. 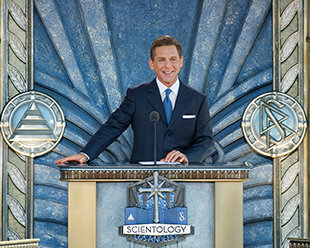 Mr. David Miscavige, Chairman of the Board of Religious Technology Center and ecclesiastical leader of the Scientology religion, dedicated the new Church of Scientology of Los Angeles on April 24, 2010, with city, county and state government officials and 6,000 Scientologists and their guests in attendance. The ceremony marked the conclusion of the full-scale redesign and construction of the Church’s 64,571-square-foot property at the corner of Sunset Boulevard and L. Ron Hubbard Way. The building is now fully reconfigured as an Ideal Church of Scientology, one that not only serves the entire community but also stands as a training center for Church executives and staff from around the world. Formerly a functional building annexed to the 1928 Art Deco Cedars of Lebanon Hospital buildings designed by Claud Beelman, the massive reconstruction began in November 2009 and encompasses new walls, all new ceilings and finishes, as well as furniture constructed in-house at the Church’s state-of-the-art custom mill with imported wood and marble from Italy. In addition to an expansive Chapel are many unique elements including an extensive public information area with 20 multimedia displays to provide answers to the question, “What is Scientology?” The new Church further includes a library, seminar rooms, film rooms, volunteer workspaces for its many social and community programs and projects, course rooms that seat over 480, and 35 rooms especially appointed for the religion’s one-on-one spiritual counseling. The Greater Los Angeles area is the seat of the religion’s Mother Church, Church of Scientology International, and Bridge Publications who publish and disseminate Mr. Hubbard’s books and recorded lectures for all of North America. Worldwide, there are more than 8,500 Scientology Churches, Missions and affiliated groups in 165 countries.